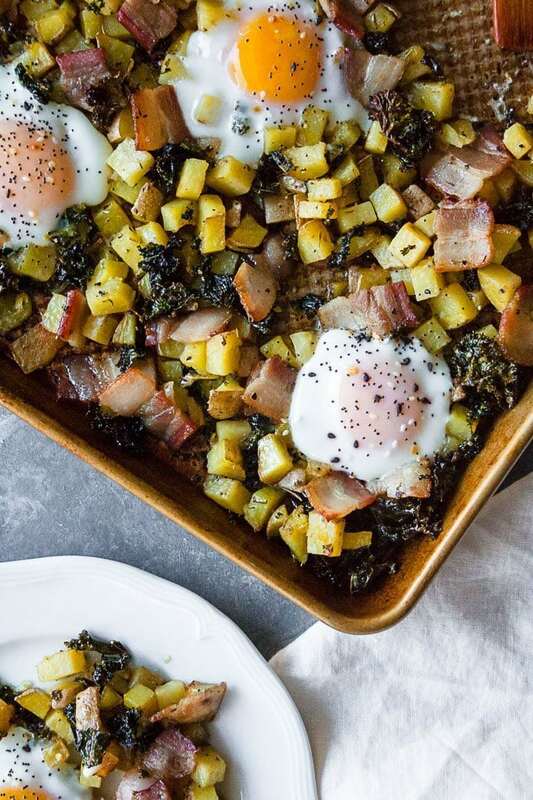 An entire breakfast of bacon, eggs, crispy potatoes, and greens all on one pan thanks to this sheet pan breakfast bake! Perfect for an easy weekend brunch with the family or serve with fruit and baked goods to feed a crowd! Welcome to SHEET PAN MEALS month on Hungry by Nature! All month long, I am going to be sharing meals made on one baking sheet… because nobody like doing dishes. One of the most viewed recipes on my site is my Whole30 Taco Frittata. While I love breakfast bakes – quiches, frittatas, stratas – they can be a little time consuming to assemble. 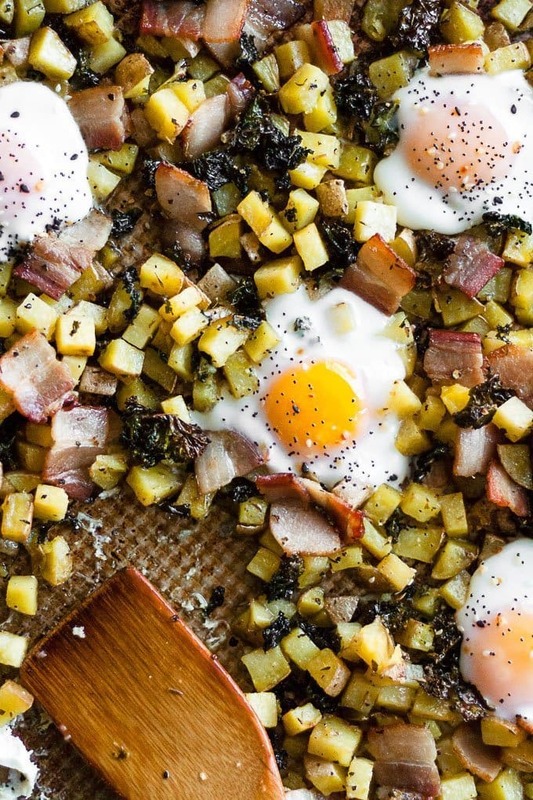 Not this sheet pan breakfast though! 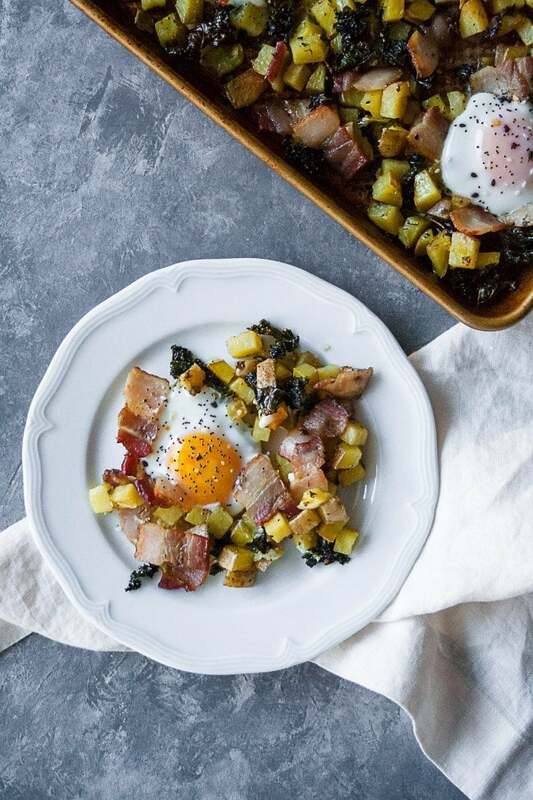 With only 10 minutes of prep (chopping potatoes and kale), you can make breakfast for the whole family and enjoy that time with each other instead. I recommend sipping coffee and working on the daily crossword – Pat’s and my new favorite activity. 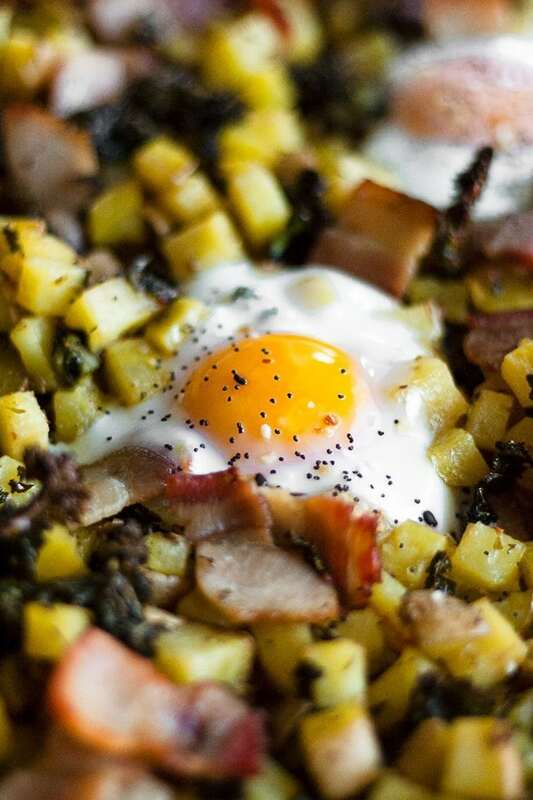 If you hate doing dishes as much as I do, I hope you try this sheet pan breakfast bake! And keep your eye out all month for more sheet pan meals!! When you make this recipe, remember to tag @imhungrybynature on Instagram! In a bowl, add the potatoes, kale, olive oil, and seasonings. Toss to combine. Remove baking sheet from oven and add potato mixture. Top potatoes with bacon pieces and place back into the oven. After 30 minutes, remove baking sheet and move potato mixture to create six wells. Add eggs gently as to not crack the yolk. Place into the oven and bake until the egg whites set, about 10-12 minutes.